The sun is finally out in St. Louis, but for two weeks it rained constantly. I am so sick of rain. Surrounded by flash floods, thunder storms, mud and humidity, I was inspired to adopt a puppy and bake crispy cookies, neither of which makes much sense. Acquiring the puppy didn’t really have anything to do with the rain. We have been missing our golden who died in December. It felt weird living in a dogless home. So it didn’t take much for me to fall for a 6 month old sheltie puppy I found on adoptapet.com. You know the saying, “Never say never,”? After our golden, the best dog that ever was, I said I was never getting another dog (way too hard to say good-bye). I also have always insisted that I was NEVER going to get a puppy. My dogs have always been adopted as adults and they arrived fully assembled. But, due to what can only be attributed to temporary (hopefully) insanity, I took one look at those big puppy eyes and forgot everything I ever knew about the time and patience required by a puppy. So, we picked up our Pax from the shelter in the rain. For what it’s worth, I don’t recommend trying to house train a puppy during day after day of rain and mud (though I suspect freezing temperatures and snow would be way worse). This little guy is a bundle of energy requiring frequent trips outside and more frequent reminders not to chew shoes, furniture, and people. He also likes to snuggle and have his belly rubbed. He joyfully consumes hours of my day. I love him and his muddy paws already. The soggy weather gave me crisp cookie cravings. The best way to counteract mushy weather moods is with a crispy cookie, though some cookies refuse to stay crispy in humid weather. 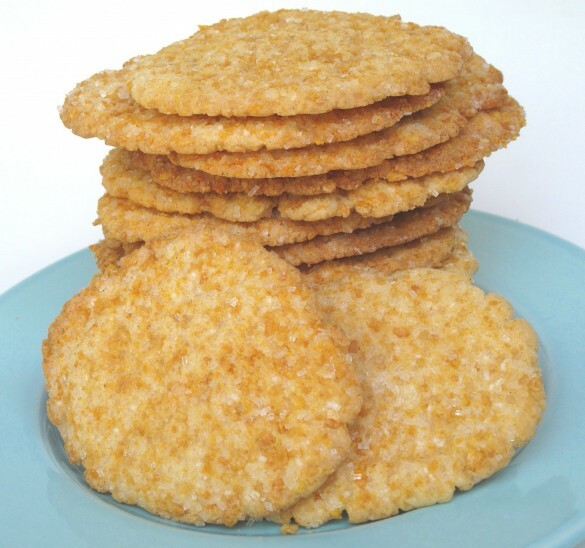 Coincidentally, while searching for desert safe crisp cookie recipes, I found out that July 9 is officially National Sugar Cookie Day. Perfect timing! Sounds like a worthwhile celebration to me. Sugar cookies can be made as roll out-cookie cutter cookies, drop cookies, slice-and- bake cookies, or rolled in balls cookies. 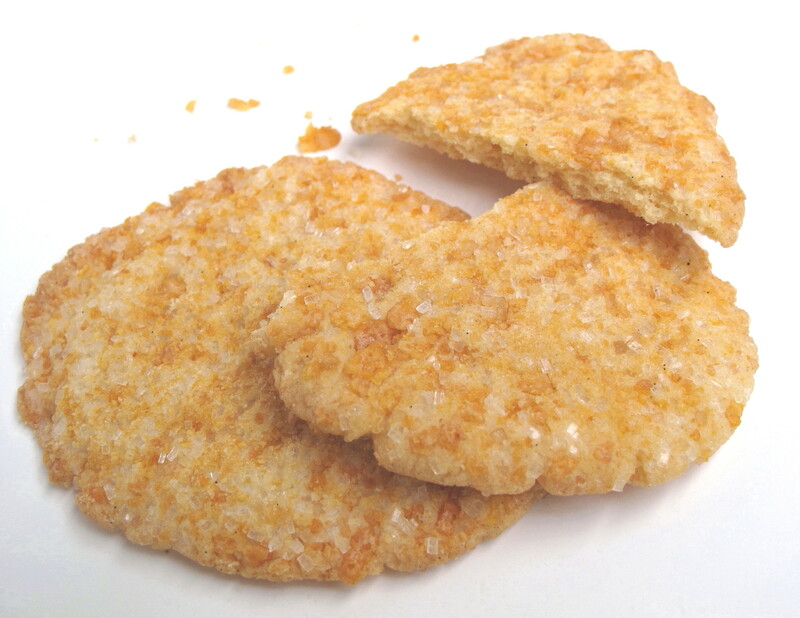 They can be baked soft and chewy or crisp and crunchy. Usually they are flavored with vanilla but almond or citrus are also tasty additions to sugar cookies. Sprinkled, sugared, or frosted sugar cookies are a cookie jar standard. One thing most of the recipes I found had in common was their use of butter. Butter is my fat of choice in baking. Butter is delicious. Butter is also not recommended for hot weather/desert care packages. It can go rancid. Making a recipe hot weather/desert care package safe means Crisco (vegetable shortening). I tried using Crisco in recipes that called for butter. Several unsatisfactory baking experiments later, it was obvious that vegetable shortening couldn’t just be substituted into whichever recipe I chose. The results were oily, the texture was off, and they oddly had very little flavor. Then I found an ideal recipe on the Crisco site. (Its not as obvious as it sounds. Most of the cookies on the Crisco site use a combination of butter and vegetable shortening.) Everyone who tried these had no idea they weren’t a butter cookie. It’s also a very versatile dough that can be made into whatever sugar cookie form is your favorite (rolled, scooped, cut into shapes). 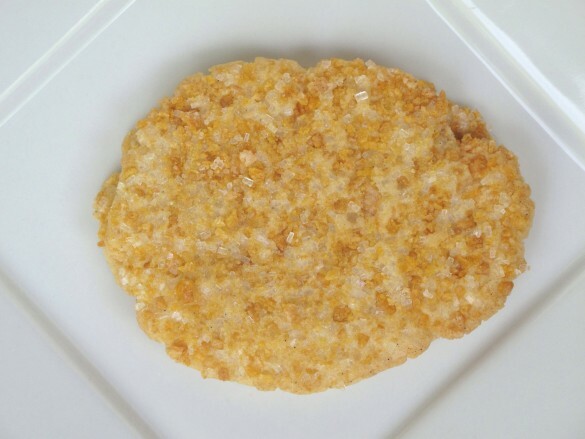 To create the crunchiest cookie possible, I scooped mine into balls then flattened them over a mixture of crushed frosted corn flakes and large crystal decorating sugar. The embedded mixture gives the finished cookies a wonderful flavor and definite crunch. This recipe is desert safe as is, no adaptations needed. It is also a crisp delicious cookie for the cookie jar at home. Stored in an airtight container at room temperature, these sugar cookies should stay fresh for at least 2 weeks. In the bowl of an electric mixer, mix the shortening and sugar until creamy. Add egg, water, and vanilla. Beat until combined. Prepare the frosted flakes by chopping in a food processor until fine crumbs (but not powder). In a small bowl, mix equal amounts of crushed frosted flakes and sugar crysals. Cut two small rectangles of parchment paper to use for rolling out each cookie. Using a small scoop or tablespoon, scoop out a ball of dough. Roll the dough into a ball, then flatten gently between palms. Place one small rectangle of parchment on counter and sprinkle generously with the frosted flake-sugar mix. Put the flattened dough ball on top of the parchment. Cover the dough ball with the other piece of parchment and use a rolling pin to flatten the dough disc (embedding the frosted flakes-sugar mix) to about 1/8 inch thickness. Peel off the top parchment and using a small spatula, gently transfer the flattened dough disc to the prepared cookie sheet, sugared side up. Repeat this process to fill the cookie sheet, placing the cookies 1 inch apart. Bake for 7-8 minutes, until the edges begin to turn caramel brown. Allow cookies to firm on the baking sheet for about 2-3 minutes before transferring them to a wire rack to cool completely. When cooled, store cookies in an airtight container at room temperature for at least 2 weeks. Crispy cookies must be packed carefully in order to arrive intact. First, double wrap pairs of cookies, bottoms together, in plastic wrap. Then, place cookie bundles in an airtight plastic storage container. Fill the container so that when the container is closed, the cookies have absolutely no wiggle room. Place padding (bubble wrap or other packing material) around the container inside the shipping box.Never pack soft cookies in the same care package as crispy ones. 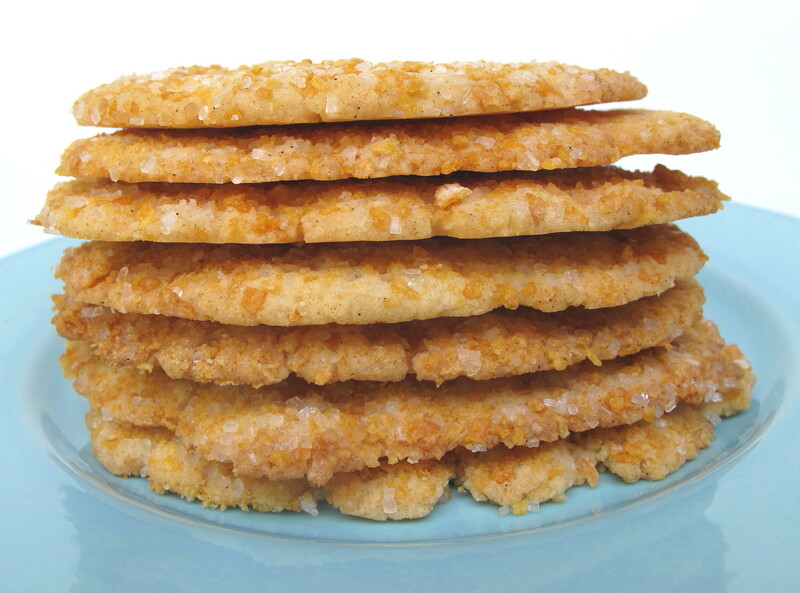 Moisture from the soft cookies will cause the crispy cookies to get soft. Wendy, this post has me smiling. Frosted flakes were my favorite cereal as a kid. I’m somewhat embarrassed to say I used to eat it with extra sugar sprinkled on top! Ahhh…to be a kid again. 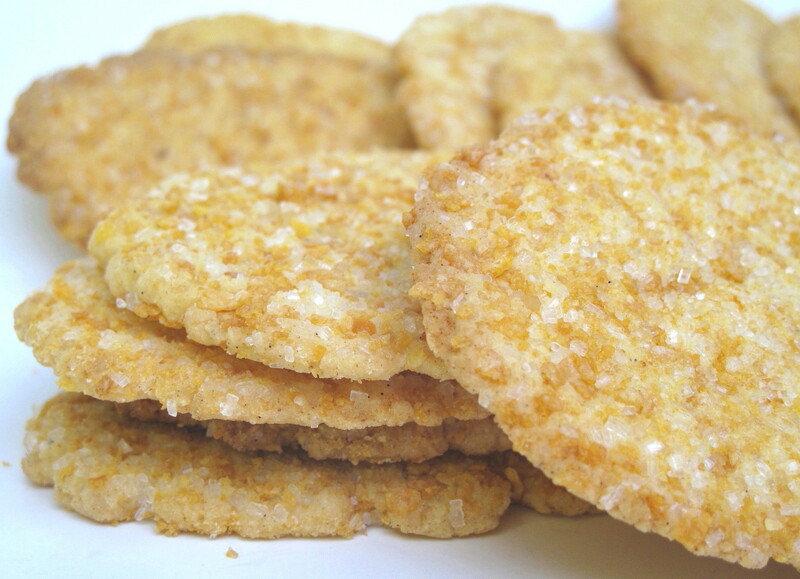 you just rolled sugar cookies in corn flakes. that’s awesome! i absolutely love sugar cookies as they are, but rolling them in cereal makes them sound magnificent. Did you name him that because he hides in cupboards? He is so adorable. I can see why you would fall for him. I am very intrigued by the butter flavoured crisco. I am always looking for dairy free options for baking. I just didn’t think that anything would be up to butter’s standard. I love the use of the Frosted Flakes. This whole post just made me smile!! I really recommend these cookies as a dairy free option. I often don’t like baked goods with vegetable shortening. I totally agree that butter sets the standard, but I think you would be surprised with these. I know I was. I tried three different recipes before this one. 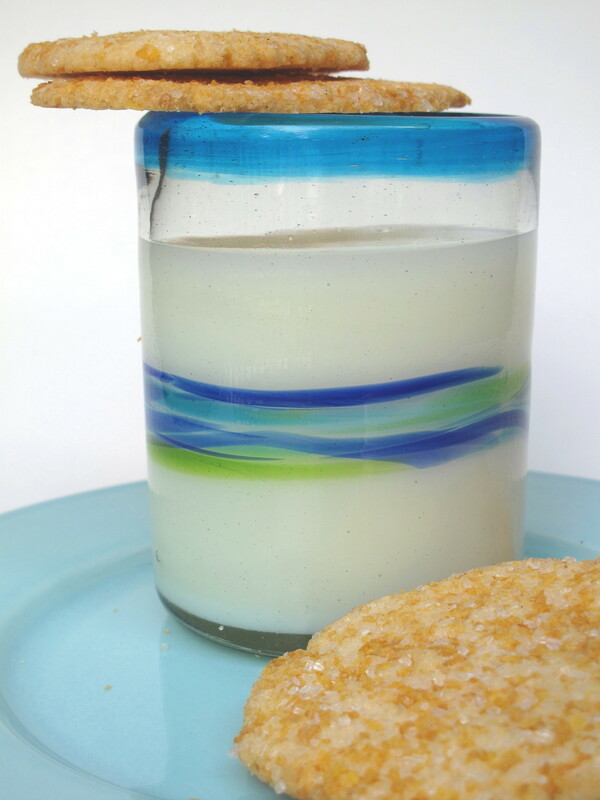 The butter flavored Crisco does not substitute for butter in just any recipe. I haven’t figured out why it works so well in this one. If you figure it out, please let me know! 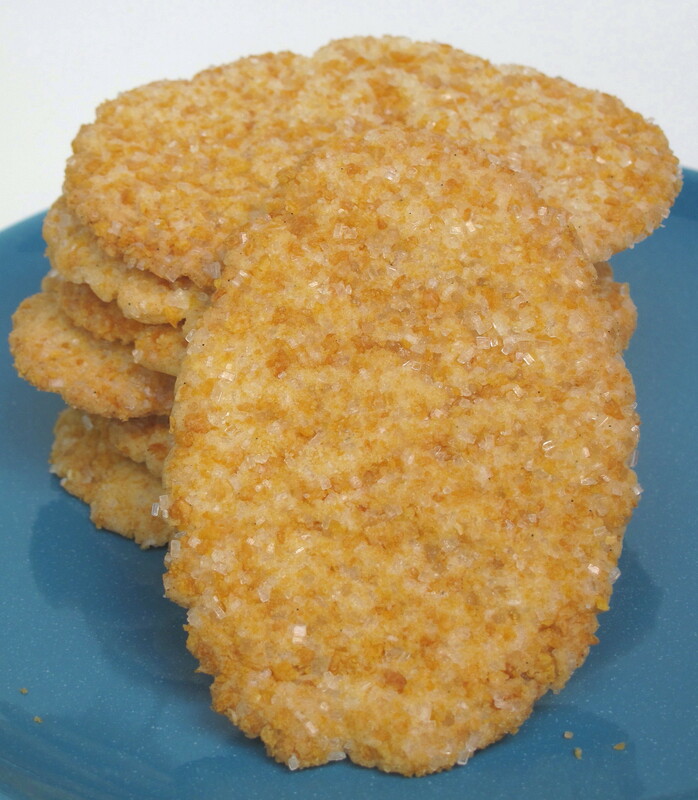 Yum, love crisp, crunchy cookies and these look perfectly delicious. I would never stop at one though, quite dangerous! I was really craving crisp, Chris, and these did the trick! However, you are right about the danger. 🙂 I wish these had made it out of the house before the weekend so that I didn’t have unlimited access! And OMG. Frosted flakes are my total obsession. I love these cookies! Thanks also for pinning. 🙂 I think you would be very happy with these cookies. I will be making them again regardless of if they are being mailed or just devoured! What a sweet little puppy Wendy! Congrats! I haven’t eaten a cornflake in years but love your cookies! They sound and look delicious! Bet the cornflakes give the great flavor. Thanks, Reeni! I was jealous of your assistant, Moon. Now I have a Kitchen Dog. 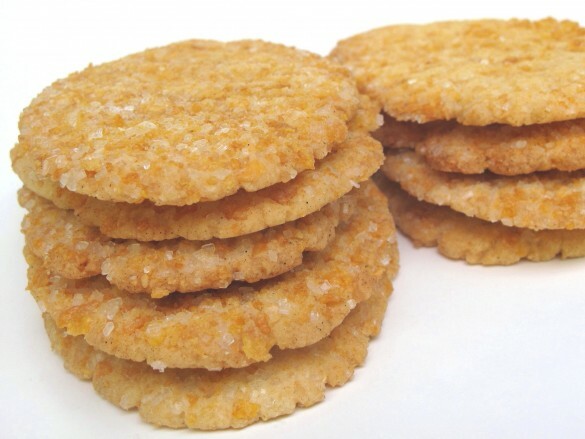 🙂 The cornflakes really work with these cookies giving them a little extra flavor and crunch. So glad to have found your site! My niece has just married her soldier before he was deployed overseas and My sisters and i want to send treats to our new nephew. You have given me several ideas to try! Cheers PS Congrats on your new adoptee. My husband and I have always adopted older dogs which means we say good bye after a few years of loving our furballs. Yet we keep doing it — because a dog-less house just is too quiet. Joy to you! Wendy, I am glad you found The Monday Box too! I hope you visit often. :)How lucky your nephew is to have married into such a loving family. No better way to send love through the mail than with a care package! 🙂 I believe it is so important to keep reminding our soldiers that they are in our hearts and prayers and that their service is appreciated!!! Please let me know how the recipes work for you or if you are searching for anything in particular. These looks crispy and delicious! Our Max is a rescue dog and he has such a special place in our heart and home, glad you have a new family member. I can’t wait to try these cookies that soon will be in my cookie jar! Thanks so much for sharing with us at Full Plate Thursday. Have a great weekend and come back soon!